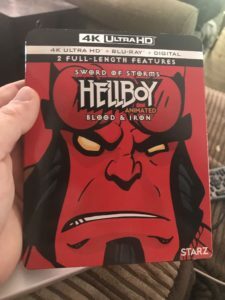 Hellboy Animated Double Feature - 4K UHD Review - ReDVDit! Hellboy: Sword of Storms is the first of the Hellboy Animated series based on Mike Mignola’s popular comic book series Hellboy and the live-action film of the same name. It was released in 2006 on DVD and premiered that later same year on Cartoon Network. The second animated straight-to-DVD film, Hellboy: Blood and Iron, was released on March 17, 2007. The film was produced by Starz Media’s Film Roman and Revolution Studios and co-produced, co-written, and directed by animation veteran Tad Stones. Stones is perhaps best known as the creator of the popular Disney Afternoon series Darkwing Duck. 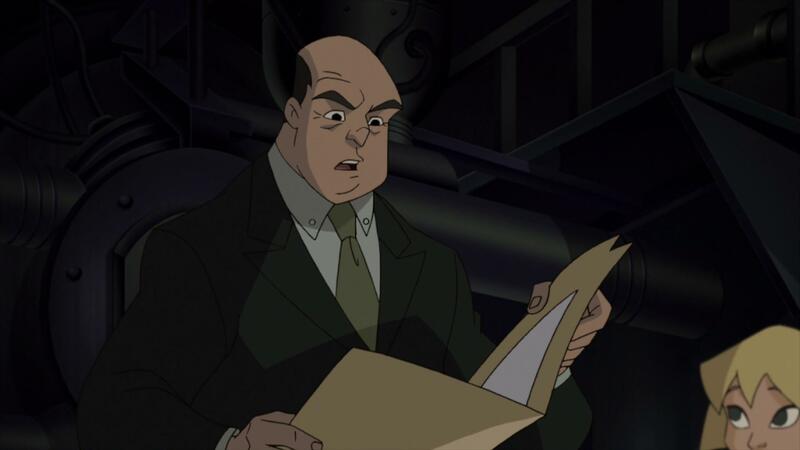 He worked with Mignola on developing Atlantis: The Lost Empire into an animated series. Blood and Iron first aired on March 17, 2007, and aired again on July 19, 2008 to promote the release of Hellboy II: The Golden Army, and was released onto DVD by Anchor Bay Entertainment on March 10, 2007. 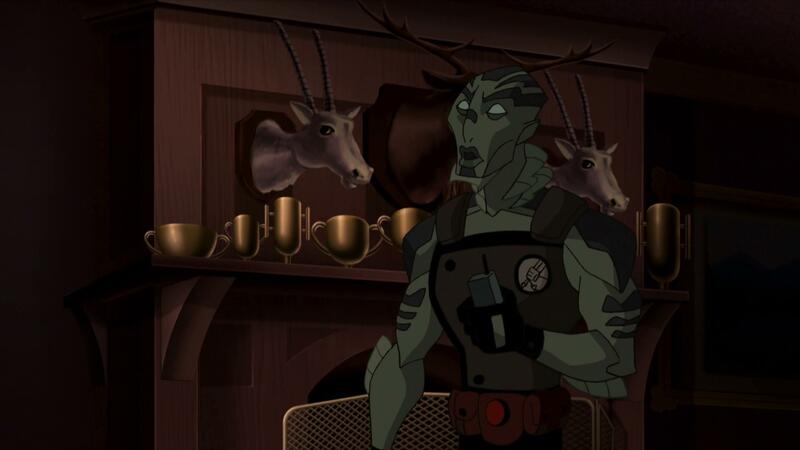 Sword of Storms centers itself around Liz Sherman and Abe Sapien as they enter into a Mayan temple, where they find Hellboy fighting against a gigantic zombie bat, and engage its zombie followers. The group are eventually able to defeat their opponents when Liz unleashes her pyrokinetic powers, although she is still not sure of her ability to control those powers. While Blood and Iron starts off with a series of flashbacks that are played in reverse chronological order. Professor Trevor Bruttenholm investigated a series of murders that happened in Eastern Europe. Erzebet Ondrushko, a vampire who has bathed in the blood of the innocent to stay young, was responsible for these killings. She had sold her soul to the Queen of Witches, the goddess Hecate, and had just kidnapped the fiancee of one of the townsmen. 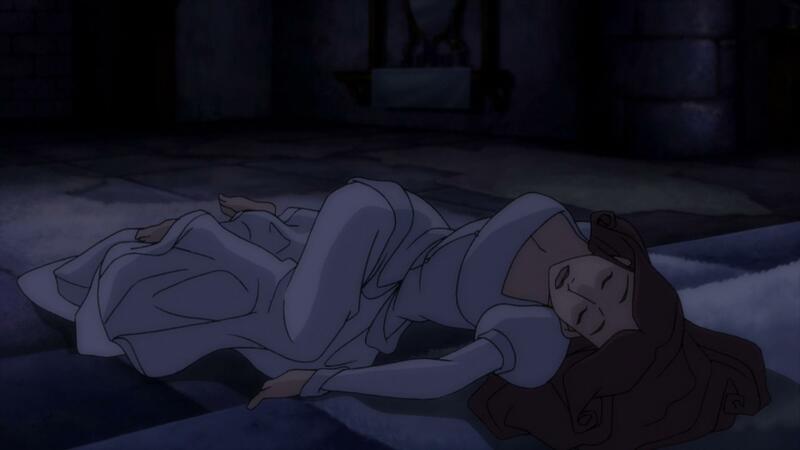 When the search party confronts Erzebet in her castle, all of the members of the party were horribly killed, and Bruttenholm was left to face off against her alone. 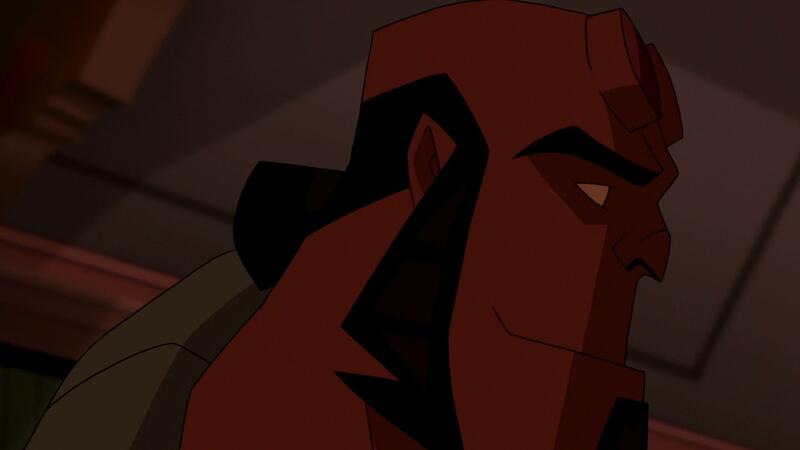 Hellboy: Sword of Storms was nominated for Outstanding Animated Program (For Programming One Hour or More) at the 59th Primetime Emmy Awards. And the title of Blood and Iron is a reference to Otto von Bismarck’s famous Blood and Iron speech; with its storyline based in part upon the Hellboy: Wake the Devil storyline from the original comics. Neither feature contained in this Hellboy double-feature were a terrible experience. As my wife and I both watched along, we found the entire experience and storylines to be intriguing; however, they do lack the overall amount of depth, fun, and drama that the live action features had. As you watch along, you can’t help but feel as if they do try to pack in too much in the roughly 70-minute timeline; and it can be pretty distracting at times. Other than that though, we found the two films to be “okay” at best while still maintaining an appreciation for the world and the overall quirkiness of the characters at hand. 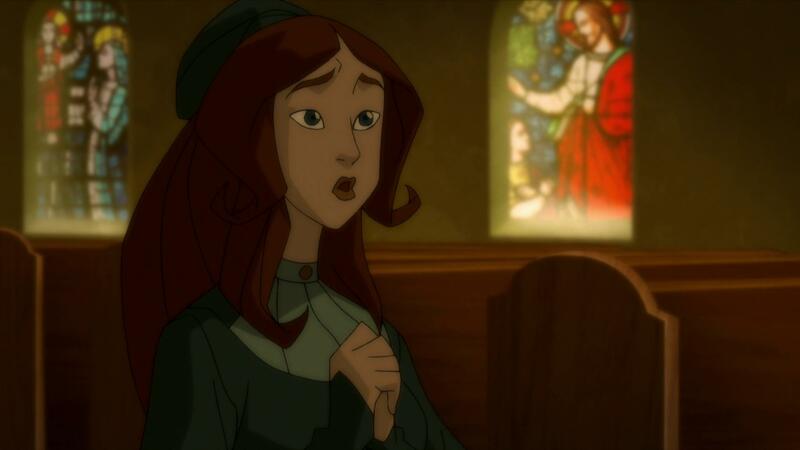 Made available in 2160p with a 1.78:1 aspect ratio courtesy of Lionsgate Films, the Hellboy Animated Double Feature is a bit of a strange release, makes you wonder why they would make this release available in 4K. Aside from a few new pieces that stand out because of the use of Dolby Vision, there isn’t too much that’s noticeably different when comparing it to the included Blu-ray disc. With the use of HDR and Dolby Vision, the colorization of the movies really popped on my living room TV, definitely showing a much sharper edge to the animation style. Visually speaking, everything about this release was clean, vibrant, and really nicely executed with the expected boosts you’d expect to see with a movie like this on the UHD format. Packaged with an all new Dolby Atmos audio track, the 4K UHD release of the Hellboy Animated Double Feature offers a nicely done, and completely refreshing experience for anyone who’s setup to use Atmos at home. When comparing it to the included Blu-ray disc, it will take a finely tuned ear to be able to spot the differences as they aren’t as impressive as some other Atmos tracks (mostly because of limitations of the source material); but overall my wife, son, and I really enjoyed the efforts behind this new track. The dialogue is spoken cleanly, and the characters are certainly able to be heard and understood without issues. The Hellboy Animated Double Feature is packaged in the standard two-disc amaray case. In that case, the UHD copy featuring the same artwork that’s been provided on the case, and the Blu-ray copy featuring a completely different piece of artwork. 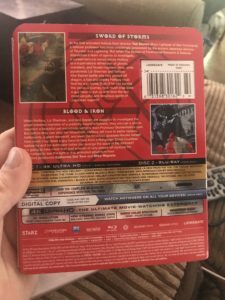 There is a digital copy redemption pamphlet, as well as a slipcover that’s been made available during the original pressing of the release. A New Breed: Creating the New Hellboy – A brief look into the pre-arrangements that happened during the conceptual phases, and the creation of the animated version of Hellboy as he had to be different from Mike Mignola’s original creations. Conquering Hellboy: The Actors Role – A look into the work provided by some of the voice actors, and a few fun snippets from the recording sessions. A View from the Top: The “Heads” Sequence – A small overview of one of the bigger moments from this film. 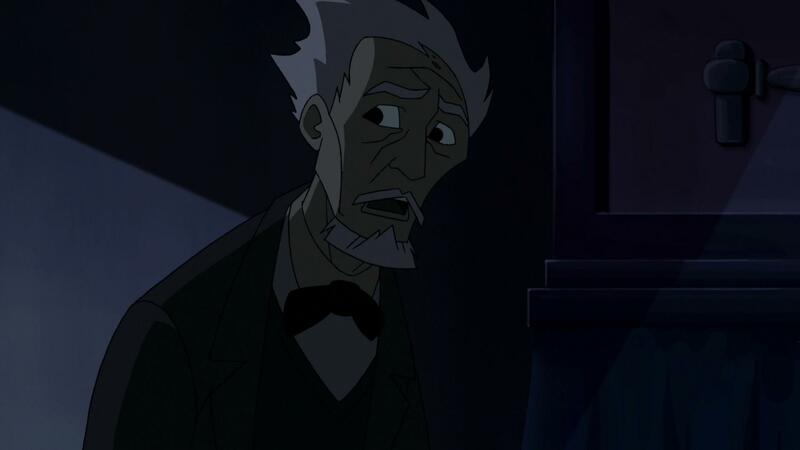 Reversal of Fortune: Professor Broom’s Story – Some introductory comments before moving onto a feature that focuses around the backstory for this character. Tales from the Tomb: A Look Inside Blood & Iron – A making of feature. Iron Shoes with Introduction by Mike Mignola – A discussion about Redcap, a character from English folklore. Overall, my wife and I enjoyed these two features for what they had to offer, and they were really a nice visit to the character as we get ready for the upcoming release of the new live-action feature. The visual and audio presentation of the UHD release were really nicely done, but unfortunately they don’t offer much in terms of a significant upgrade over the Blu-ray copies (based on the Blu-ray that was included with this set). The special features that were included with this were really a nice touch considering that previous releases didn’t have any! If you’re considering this release for your collection, I’d recommend grabbing it if you don’t already have the earlier Blu-ray copy, or are simply just looking to expand the supplemental materials for the titles in your library. 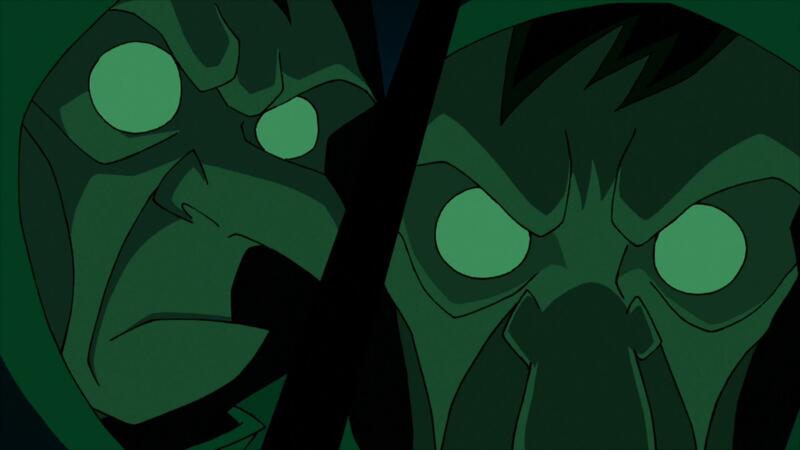 The Hellboy Animated Double Feature is available on 4K UHD today.